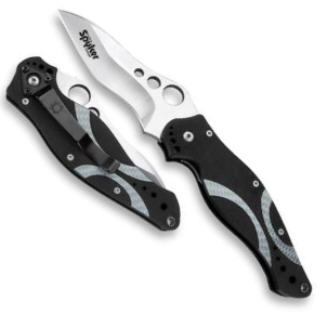 The SpyKer appears to be a Kershaw while equally resembling a Spyderco. Kershaw’s chief designer and prominent knifemaker Ken Onion is responsible for the pleasingly curved shape while Spyderco’s Sal Glesser adds the Spyderco Round Hole and expected ergonomics. The CPMS30V steel blade is hollow-ground with a spine swedge. From midway along the cutting surface. Spyderco’s Round Hole, a mark of quality in the industry, is lined up with two smaller holes of descending size. The three holes grouped by size are a design feature associated with Kershaw symbolizing their quality and craftsmanship. Precision-machined G-10 handles are inlayed with silver carbon-fiber twill and assembled with an adjustable pivot pin and phosphor bronze bushings. Set behind the cutting edge, a finger choil optimally positions the hand for advanced control. A black steel pocket clip carries the knife tip-down in a pocket.